Even though gingerbread is not my favorite, it’s such a classic cookie and a lot of people really enjoy the flavor. This is a pretty mild gingerbread as far as I can tell, and very easy to mix together. 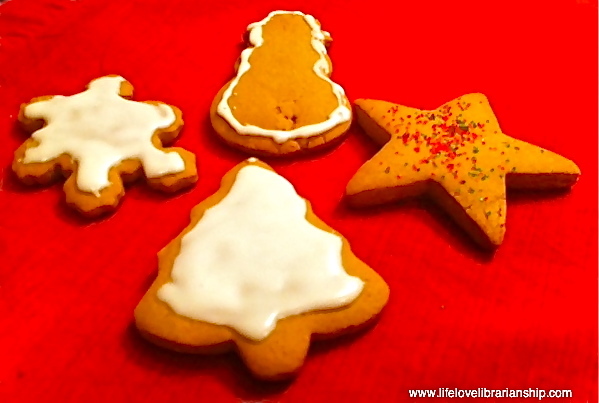 Just be sure you have some time to chill the dough and decorate the cookies!! Sift flour, baking soda, ginger, cinnamon, nutmeg, and salt together in a small bowl. Set aside. Cream butter and sugar together until smooth and light colored, 2-3 minutes. Beat in eggs one at a time, and then beat in molasses. With the mixer on its lowest setting, gradually mix in dry ingredients. You may need to switch to a rubber spatula to get everything well mixed. Wrap dough in plastic wrap and chill for an hour. Preheat oven to 350°. Working with 1/4 of the dough at a time, roll it out to a 1/8 inch thick. Cut out with cookie cutters. You can reroll the scraps. Bake on cookie sheets for 9-11 minutes, or until the edges just begin to brown. Let cool on wire racks before frosting* and decorating as desired. Have you entered my giveaway to win a $25 gift card to King Arthur Flour? My sister made cat-shaped dog biscuits yesterday. Whatev. I love gingerbread cookies! Thanks for sharing the recipe.